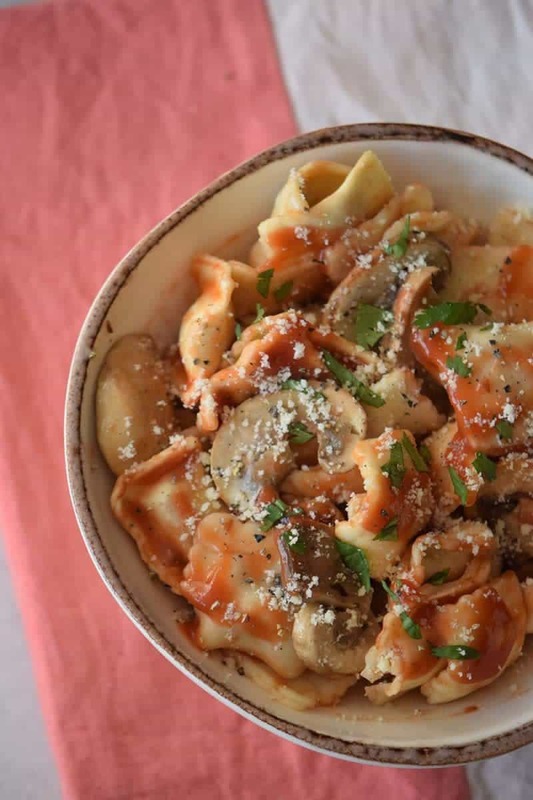 This hearty, homemade mushroom Bolognese sauce is easy to make and pairs well with ravioli, gnocchi, or any other pasta that your heart desires. Italian food is both comforting and hearty. In other words, it's the perfect comfort food. While a quick plate of spaghetti is okay for dinner, it can get old after a while. If you're looking for something new, yet easy to prepare, this mushroom bolognese is sure to become a family favorite. The best part of this recipe is the homemade sauce. Don't let the thoughts of homemade sauce frighten you though. This Mushroom Bolognese sauce, while incredibly delicious, is easy to make and contains easy to find ingredients. In fact, you probably have most of the ingredients in your pantry. 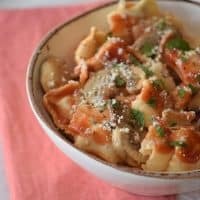 The second best thing about this recipe is using pre-made ravioli. The homemade sauce is so delicious that you can use a store-bought product and no one will ever know. If you're looking for a casual dinner option for winter entertaining, this is a good choice. It's also the perfect option for a quick family dinner on a busy evening. If you want, you can also switch up the flavor of ravioli that you use. 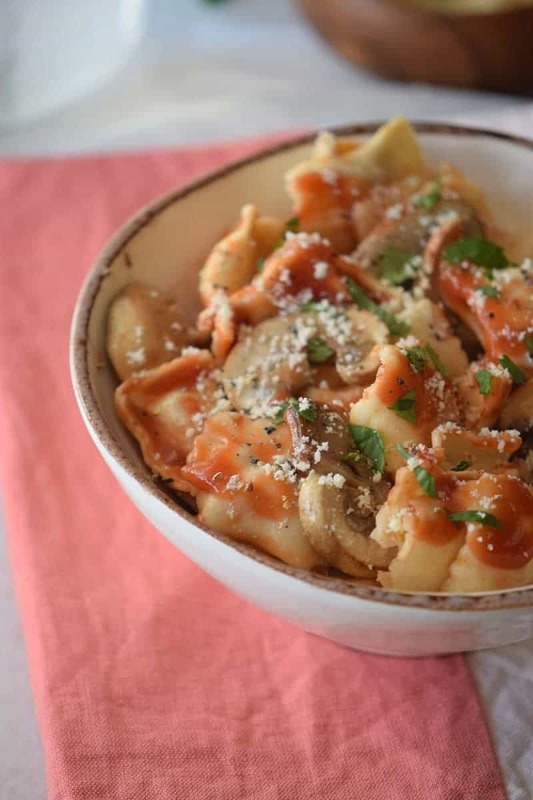 Try making this recipe with cheese or mushroom ravioli. Or, try using different pastas. This Mushroom Bolognese sauce would be wonderful served over gnocchi. In a large saucepan over medium heat, cook the onions, garlic, olive oil, salt, and pepper. Add the tomato sauce, 1 cup water, mushrooms, oregano, and sugar. Stir for 3 minutes. Let the sauce simmer for 10-15 minutes. While waiting, boil water with salt in a pot over medium-high heat. Add the pasta and cook as instructed on the packaging. Drain the pasta and serve in plates. Pour the sauce over the pasta, and top it off with basil and parmesan cheese. Tip: Add ground ginger to the sauce to give a spicy flavor. This looks so delicious and it’s a must try for me.I love all the ingredients and spices and best of all it sounds easy. This looks so tasty and easy to make! I can imagine it being a great sauce to serve for guests to impress them, too. I love me some mushrooms. This bolognese looks wonderful. I like that it is meat free. I have to eat meat because I am anemic, but I would prefer not to. This is a great alternative to meat. I love mushrooms and this sounds delicious! I love anything with mushrooms in it! Looks like this would be a delicious recipe to make – thanks for sharing! I’ve never tried Bolognese with mushrooms. Yummmy idea! This sounds Awesome! I love Mushrooms and can’t wait to try this recipe! Thanks! I added to my must try recipes! I love about anything with mushrooms. Thanks for the recipe. This looks delicious. We will have to give this a try. I made my first Bolognese not long ago. I really loved it (the husband, not so much – but then again it was easier to get my girls to eat things when they were little than it is to get him to eat anything. The recipe I used had it paired with Parmesan polenta and can say that it was the perfect combination. 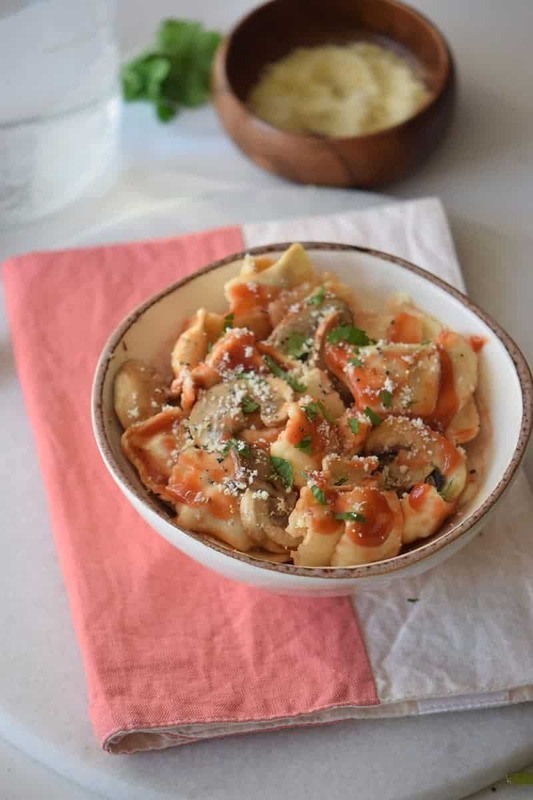 The sauce you made here is meatless, so this would work well for Meatless Monday (minus the beef ravioli, of course).